With the release of the new 2017 Autodesk products comes a to-do list that needs to be completed before you can finally play around and use your new products. For network license users, this means you’ll need to update your Autodesk Network License Manager (LMTools) and generate a new Network License file. In this post we’ll go over a new and easy way to generate Network License files using Autodesk’s new Network License File Generator. For info on updating your LMTools click here. To start, sign-in to your Autodesk Account at manage.autodesk.com. Once you’ve signed in, it brings you to the Management screen where you can see your current Autodesk products. Under the ‘Products & Services’ tab is a section titled ‘Quick Links’ where you’ll find the ‘Generate Network License File’ link. Click this link to begin the process. The site then brings up the screen you see below. From here you designate a license server model from the options provided. Most users will have a single server model. For more information on Redundant and Distributed servers click here. Once you have designated a license server model it will provide a space for you to enter your Server Name and Server ID. The next step is to click the icon below the server name and select the products you want on this server. Once you click the icon it brings up a list of products available to you. From here you select the products you wish to have licenses generated for. You can either scroll down the list or search keywords up at the top to find the products you need. Once you are done choosing your products click ‘Add Selected’. Now that you have all the products selected, all that’s left is to double check the information such as Server Name, Server ID, and products. Once you’re sure you have everything ready, go ahead and scroll down to the bottom of the screen and click where it says ‘Get license file’ to generate your Network license files. License information is displayed according to the servers and products you specified. Now you’ll have a few different options on how to save your license file. Click Copy to clipboard to copy this information to be pasted into a license file. Click Save as… to save the license file to a specified location. Clicking Send and close will email you the license file to the email address associated with your Autodesk account. If you provide additional email addresses, the license file will be sent to those addresses as well. For distributed servers, license files are generated separately for each server and this form will be displayed once for each license file. 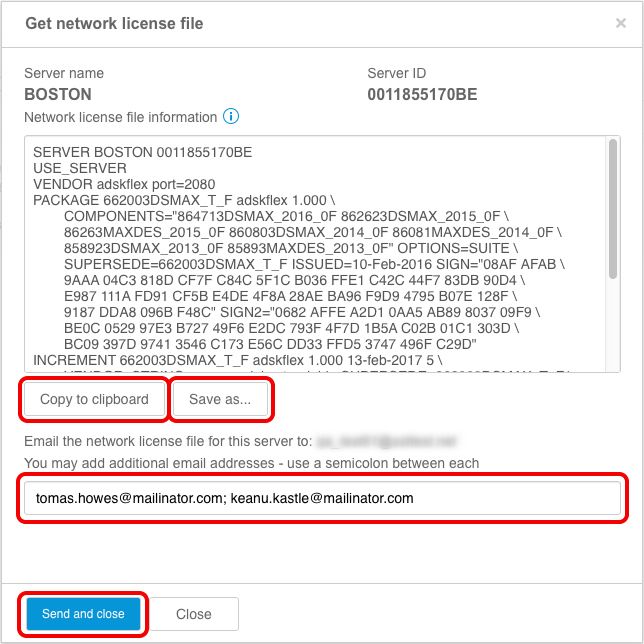 Click Send and next to email each license file and advance to the next license file. Click Send and close when you have reached the last license file. The license file you generated will have a default name such as, NOSTROMO0011855170BE.lic. Feel free to rename the license file to something easier to read, but it must keep “.lic” extension. It is important to confirm that your license file has correct info after you generate your license file. Your license file will only work on the machine that has the same physical address (MAC address) as shown in the license. If the host name does not match the host name of the server, you can modify the host name in your license file. If the physical address does not match the physical address of the server you must generate a new license with the correct physical address. Open the license file using a text editor (such as Notepad or TextEdit). Note: Do not use Microsoft Word or any other word processing program that might modify the formatting of the license file. After you verify that your license file is correct, you can close it and configure your network license server. This new Autodesk Account tool makes it easier then ever before to generate Network License files. No longer will you have to scour the internet and watch how-to videos when you need to generate a new license file. You simply sign in to your Autodesk Account, fill out your server info, select your products, and you’re ready to go. Now that you have your license file are you wondering where to put it? Are your 2017 products not launching or giving you errors? Check out our post on updating your Network License Manager to solve these issues. There’s only one more step left on our way to 2017. Watch for our next post on how to find and download your 2017 software. Leave any questions or comments in the section below.